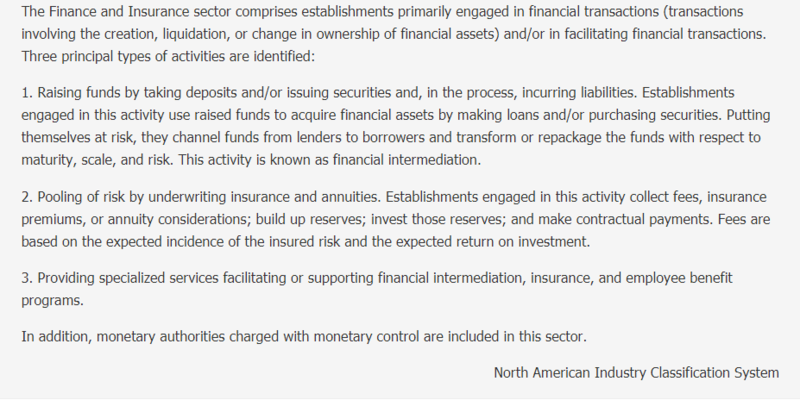 The Finance and Insurance sector is part of the Financial Activities supersector. 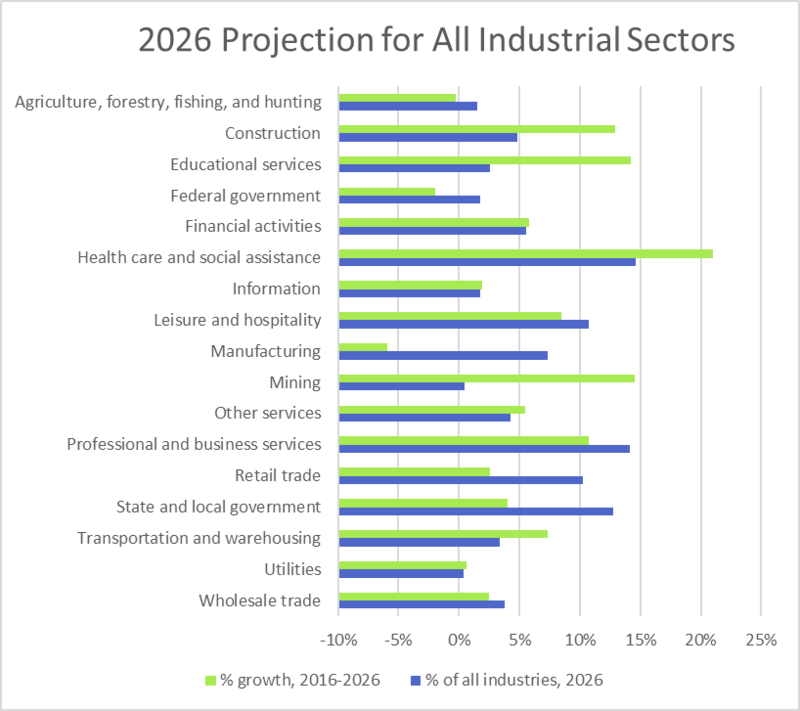 The following chart shows the percentage of people that this sector employs, relative to all the other industrial sectors and the projected growth of this sector through 2026. This next chart breaks down the sector into its primary industries. 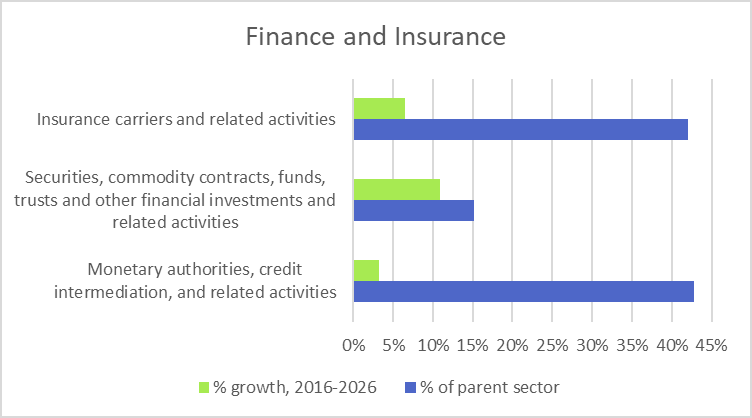 It shows the percentage of people that these primary industries employ, relative to the entire sector, and the projected growth of these industries through 2026. The following table shows the top 10 projected occupations, in size, for this sector through 2026. It also shows the educational requirements and OJT requirements for these top-sized occupations. The OJT.com training directory provides a listing of the state-by-state training providers that can fulfill your on-the-job training requirements. The following table shows the top 10 projected occupations, in growth, for this sector through 2026. It also shows the educational requirements and OJT requirements for these top-growth occupations. The OJT.com training directory provides a listing of the state-by-state training providers that can fulfill your on-the-job training requirements. At OJT.com, we connect you with the best on-the-job training programs and on-the-job training providers. Whether you are looking for job training manuals, job training videos, on the job training programs, or any other sort of job training programs, OJT.com can help you. Drop OJT.com a line today and let us help you with your job training needs! Call 866.465.8266 to speak with someone on our project evaluation team. We get the workforce of the future prepared for success while assisting in securing On-the-Job Training partnerships.